In Drosophila pupae, the detachment and expulsion of apoptotic cells from the epithelium is driven by: remodeling of adherens junctions between the apoptotic and neighboring cell surfaces, the contraction of actomyosin structures in both apoptotic and neighboring cells, and the modulation of tensional forces within the tissue. These findings were published in Development in 2017. Teng X et al. Remodeling of adhesion and modulation of mechanical tensile forces during apoptosis in Drosophila epithelium. Development. 2017. 144(1). 94-105. doi: 10.1242/dev.139865. More information on Toyama Lab. Figure: The schematic depicts the basal extrusion of an apoptotic LEC during histoblast expansion in Drosophila pupae. The apoptotic cell undergoes apical constriction due to the contractile activity of an inner actomyosin cable formed in the cell. This is accompanied by the disassembly of adherens junctions between the apoptotic cell and the neighboring cells and the apoptotic cells is able to extrude basally. A reduction in junctional tension in the tissue triggers the purse-string like contractile activity of a supracellular actin cable that is formed connecting the neighboring cells. 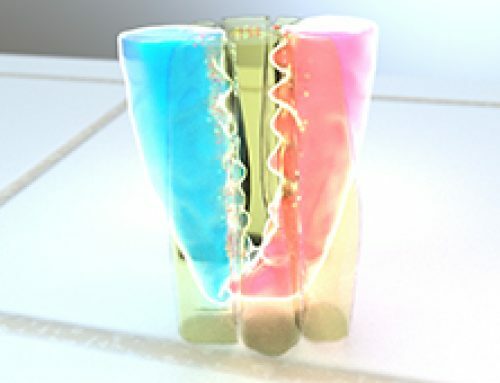 As a result, neighboring cells are pulled together to close the gap created by the extruding cell. During histoblast expansion in Drosophila pupae, the old, apoptotic larval epidermal cells (LECs) are replaced by rapidly proliferating and migrating histoblasts lying adjacent to the LECs. The apoptotic LECs detach and extrude basally through a well-coordinated sequence of molecular events, accompanied by the modulation of tensional forces within the epithelial tissue. The cell extrusion process starts with the activation of caspase-3 activity in apoptotic LECs, which together with the formation of an actomyosin cable, initiates apical constriction in these cells. Following this, the adherens junctions at the interface of apoptotic LECs and non-apoptotic neighboring cells get remodeled and the levels of adherens junctions components such as E-cadherin decrease. As the adherens junctions give away and the apoptotic LECs extrude, there is a release of tension within the neighboring cellular interfaces, which triggers the assembly of a supracellular actomyosin cable that interconnects these cells. The purse-string like contractile mechanism of this supracellular actin cable pulls the neighboring cells together, which then form new intercellular connections and seal the gap created by the extruding LECs. What are adherens junctions and how is their assembly initiated by cadherins? 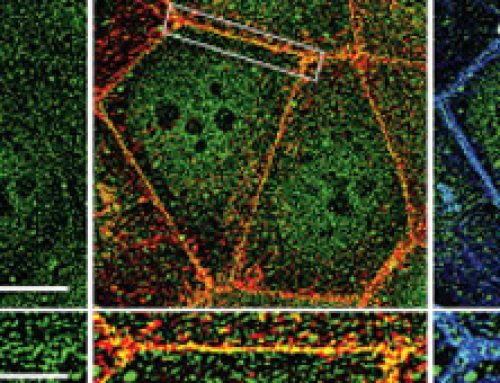 What is actomyosin and how does it facilitate contractility in cells? What type of forces do cells encounter? Adherens junctions (AJs) are cell-cell adhesion complexes that are continuously assembled and disassembled, allowing cells within a tissue to respond to forces, biochemical signals and structural changes in their micro environment. Adherens junctions regulate cell shape, maintain tissue integrity and translate actomyosin-generated forces throughout a tissue. A key component of adherens junctions are cadherins. The cadherin protein family are common cell-adhesion molecules (CAMs) that mediate cell-cell contacts at anchoring junctions (e.g. adherens junctions, desmosomes) and at prominent sites of cell-cell communication (e.g. neuronal synapses). There are over 100 different cadherin family members that are grouped into at least 6 subfamilies, including type I classical cadherins, type II atypical cadherins and desmosomal cadherins. Most cadherins adhere by homophilic interactions (i.e. they bind to the same type of cadherin) but certain types (e.g. E-cadherin) also adhere by heterophilic interactions (i.e. they bind other types of cadherin). The interactions can take place laterally on the same cell, called a cis interaction, or between two cells, called a trans interaction. Cadherins also bind the intracellular proteins p120-catenin and β-catenin, after which α-catenin is recruited by β-catenin. A vast network of adhesion receptors, scaffolding proteins, actin regulators and signaling proteins regulate the formation of this complex, via a complex network of interactions, which is currently being characterized and has been named the cadhesome. Actomyosin refers to the actin-myosin complex that forms within the cytoskeleton. Actomyosin is inherently contractile, with the myosin motor protein able to pull on actin filaments. This property gives rise to contractile fibers that form the basis of skeletal muscle, and even in non-muscle cells, enable cell motility and force generation at the sub-cellular level. During non-muscle actomyosin contractility, non-muscle myosin II uses energy from ATP hydrolysis to slide the actin filament to produce contractile force, and these forces have been implicated in multiple cell functions, such as cell adhesion, establishing cell polarity, and cell migration. 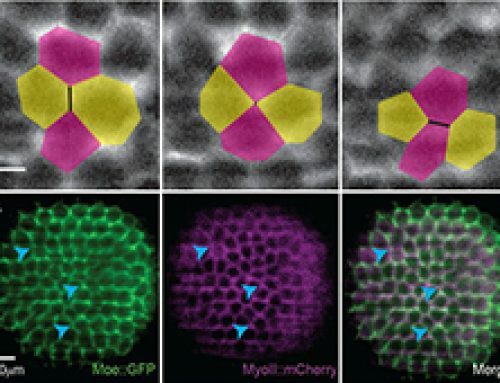 During cell division, actomyosin contractility regulates forces on the nucleus which affect DNA synthesis and chromatin organization, and is also required for formation and contraction of the mitotic spindle. Cells and subcellular structures experience forces from a variety of sources. In general, forces are developed from within the cell via the cytoskeleton (endogenous forces) or come from outside the cell (applied forces). Forces exerted on the cell are often dynamic in nature, requiring the cell to constantly re-evaluate its status and adjust its internal and external morphology accordingly. 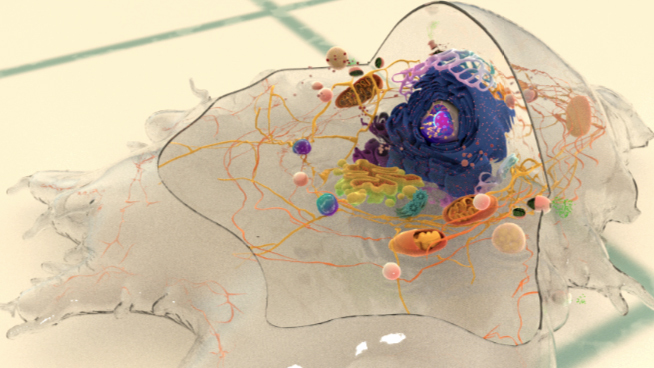 Although the mechanosensors and mechanotransduction events occur locally at the cell periphery, the forces and biochemical signals are transmitted throughout the cell and are integrated over time. In general, they promote stiffening, softening, and reorientation of cytoskeletal filaments. During histoblast expansion in Drosophila embryos, old larval epidermal cells (LECs) extruded basally and were replaced by rapidly proliferating and migrating histoblasts. Mechanical impact of LEC extrusion on neighboring histoblasts: The nearest and next-to-nearest neighbor cells elongated and the extent of elongation decreased with increasing distance from apoptotic LECs. The extrusion of LECs was initiated by an increase in caspase-3 activity, which preceded the onset of apical constriction in LECs. E-cadherin levels decreased at the interface between apoptotic LECs and neighboring cells, which included both histoblasts and non-apoptotic LECs. Similar to E-cadherin levels, the levels of other adherens junctions components beta-catenins and alpha-catenins also reduced during LEC apoptosis. The reduction in E-cadherin and other adherens junctions (AJ) components is indicative of adherens junctions remodeling between the extruding LECs and its non-apoptotic neighbors. In contrast to adherens junctions components, the levels of septate components did not decrease during LEC apoptosis, and septate junctions were found to be stable throughout the process. There was an increase in myosin II distribution around the periphery of apoptotic LECs, and actin colocalized with myosin in these regions. Together, they formed two actomyosin cables: an inner cable in the apoptotic LECs that contributes to apical constriction and an outer supracellular cable that contracts in a purse-string like manner to pull up neighboring cells following LEC extrusion. The actomyosin cables formed at different times in apoptotic LECs Vs non-apoptotic neighboring cells. In apoptotic LECs myosin II levels increased soon after the onset of apical constriction, while in neighboring cells myosin accumulation occurred later and coincided with the remodeling of adherens junctions. 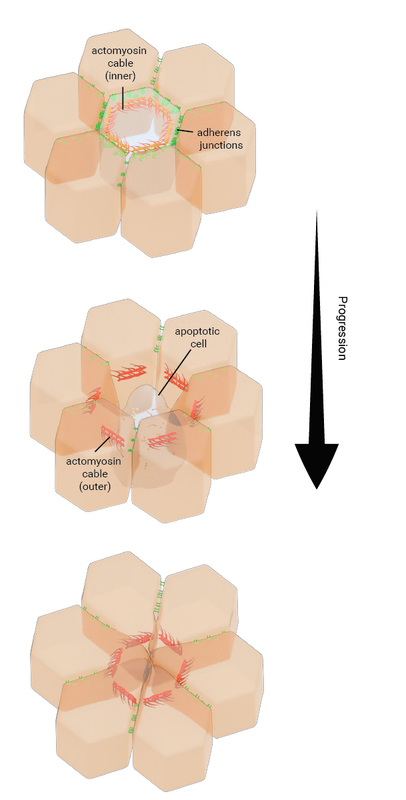 The formation of actomyosin cables, apical constriction, and remodeling of adherens junctions occurred in a caspase-dependent manner, since these events did not occur in the presence of caspase inhibitor, p35. 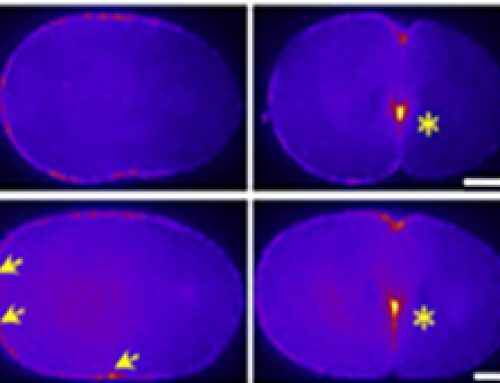 In apoptotic LECs that are surrounded by myosin-II defective neighbors, the onset of apical constriction was much slower and took longer to complete. This suggested an essential role for supracellular actomyosin contractility in neighboring cells in mediating the apoptotic cell extrusion process. The junctional tension between apoptotic LECs and neighboring cells decreased with a reduction in E-cadherin levels, as quantified by laser nano-ablation techniques. However, the junctional tension was rebuilt during later stages of apoptosis. Laser ablation was performed to quantify the junctional forces in the Drosophila epithelium during the cell extrusion process. The study provides insights into the highly coordinated and dynamic cellular and molecular events that ensure the maintenance of tissue integrity during cell extrusion process. This knowledge is important to understand how healthy, functional tissues are maintained during development as well as during tissue repair and regeneration in adult organisms. 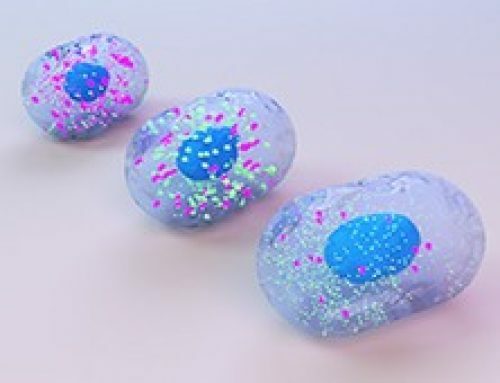 Also, this knowledge could be useful in the field of regenerative medicine, wherein better optimization of tissue engineering conditions could lead to improved clinical results.